A secured credit card is one of the most straightforward and safe ways to reestablish your credit. Typically, a credit card will advance you money from the credit card company. Secured credit cards ask you to put up that money in advance. A secured credit card is similar to a debit card; you set up a bank account and deposit an amount of money associated with the card. The account draws from those funds to pay your charges on that credit card. If you put $500 into your bank account, you can only charge up to $500 on your card. You should pay off the balance every month to establish a good relationship. With secured credit cards, you are typically rewarded for good behavior. A bank will increase your credit line without asking you to deposit more money. Slowly, a credit relationship is developed. Some banks only offer secured credit cards to people who are establishing credit for the first time, rather than people who have mishandled their credit in the past. Be smart when shopping around for a secured credit card. Be on the lookout for a secured credit card that doesnâ€™t charge an application fee. Every secured credit card will charge an annual fee, but they can vary dramatically. Shop around for the secured credit card with the lowest fee. Credit unions often offer secured credit cards to their members at a reasonable cost. Many banks donâ€™t offer secured credit cards, but will offer credit cards with low credits. These cards almost always have high interest rates and fees. Questions to ask when searching for a secured credit card. â€¢	Does the credit card company/bank report to the three major credit bureaus: Experian, Equifax, and TransUnion? This is a very important factor in reestablishing your credit. Youâ€™ll want to establish a relationship with a credit card company that will make your credit history available upon request. â€¢	How long do I need to have a secured credit card with your company before I qualify for an unsecured credit card? Typically, the time frame is about a year. Youâ€™re looking to establish a relationship with a company, so be sure it is one that will meet your needs for the next few years. â€¢	How much interest will my deposit earn? Look for a credit card company that will give you about as much interest as you would get from a savings account at the bank. 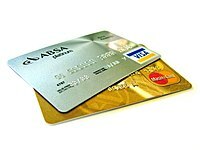 â€¢	How can this secured credit card boost my credit rating? A secured credit card will boost your credit rating if you use it to charge a few things every month and then pay off the entire amount. Do not carry a balance on the secured credit card. Keep in mind that if you do have bad credit history, you donâ€™t have to live with it forever and you can take steps to improve it.